Desfrute de um itinerário flexível e atenção personalizada neste passeio de Gjirokastra e Castelo Lekuresi de Saranda. Com a companhia do seu guia dedicado, explore o Gjirokastra, Patrimônio Mundial da UNESCO, e suas ruas de paralelepípedos ao redor, depois faça uma parada no Castelo Lekuresi e no Blue Eye durante a viagem de retorno a Baku. Picked up promptly at the hotel and set out for the day. We had a good driver which is important here. As we went up over a mountain pass on the winding roads it began to rain quite heavily but we never felt unsafe. Thankfully the rain did not last too long and we were able to enjoy the beautiful scenery. We stopped at a lovely café for a quick bite and some coffee before heading on to Gjirokastra where we stopped to visit the castle and the museums inside. Walking back to the car it threatened to rain... our driver ran to the car to get umbrellas for us, which were thankfully not needed. The next stop was a walk through the town centre. We bought some fresh byrek from a small shop along the way. One of the best parts of Gjirokastra was visiting an old Ottoman home and having a tour inside - it is amazing how they designed the home to accommodate the requirement that the women of the house not be seen by male guests cooling plumbing entertaining. Sadly our time in the town ended and we headed back to visit Blue Eye which is absolutely gorgeous, and Lekuresi Castle, which is really just a restaurant now with its stunning views over Saranda, Ksamil and back towards Gjiroskastra. What made the whole trip the most memorable and enjoyable was not just the places visited, but most of all our guide Antonella. She speaks very good English and has a real love for people and for her country of Albania. 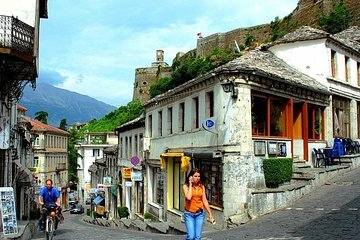 Best of all, she lived in Gjirokastra for a few years and when you go there with her, it is not just visiting a city it is like you are visiting her home. It was a joy to not just visit museums, but to hear stories of her life in Gjirokastra, of what life was like during the time she lived there. She also knew so much about the towns and villages along the way between Saranda and Gjirokastra. Thanks to Antonella and her knowledge we got to know this small part of Albania in a way we never could have had we simply driven ourselves and wandered around on our own. Several times during the day the boss would call to ensure that the guests were enjoying the day, and asking if we needed anything. The level of service and commitment to providing the best care for their guests is above and beyond anything I have experienced in other countries.